Research and production corporation United Wagon Company (UWC) has completed the delivery of sixty flatcars on bogies with enhanced axle load to Transcontainer. The cars are intended to carry heavyweight containers. Transcontainer received 30 model 13-6851-05 flatcars (40 feet) and 30 model 13-6903 flatcars (80 feet); all were delivered in December 2018. 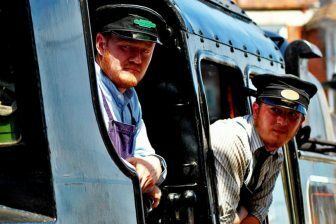 Both models have innovative bogies with an axle load of 25 ft. Moreover, they offer load capacity gains, which is suitable for heavy freight and tank containers weighing up to 36 tonnes. Key features of the freight cars include enhanced reliability and safety during cargo transportation thanks to design specifics of the bogies and the center sill. The quantity and placement of twist locks enables containers to be placed on the cars in various combinations. Transcontainer is the largest owner of specialised rolling stock in Russia, the CIS and Baltic countries with almost 26,000 flat cars for containers and over 67,500 heavyweight containers. The 13-6851-05 model flat car has a load capacity of 80 tonnes and a loading length of 40 feet. 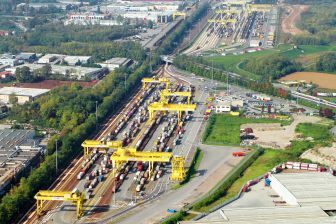 An energy-intensive draft gear enables the transport of containers with hazardous goods. The service life of the car is forty years. The 13-6903 flat car has a load capacity of 74.5 tonnes and a loading length of 80 feet, enabling carriage of up to 11 tonnes more cargo in comparison with most common models presently used on the market. 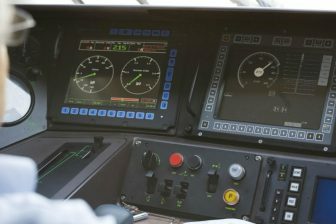 The ability to transport containers, including refrigerated containers, with a gross weight of up to 36 tonnes renders the 13-6903 unique among long-wheelbase railcars. Local technical guidelines for placement and securing of heavyweight containers on the 13-6903 model have been officially approved. Its service life is 32 years. An extended interval between scheduled maintenance (up to 1 million km or 8 years) is a significant competitive advantage of both models. It slashes the life-cycle cost of the cars by almost three times compared to that of their previous-generation analogues. Maintenance facilities for the flat cars, as for all rolling stock manufactured by UWC, are in place throughout the whole 1,520-mm gauge area, where the Holding’s freight cars are operated. 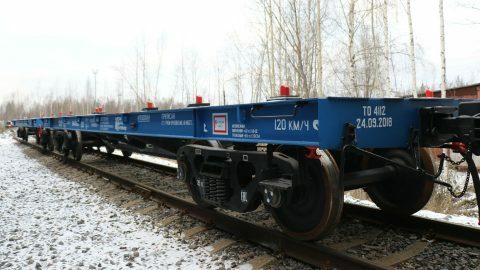 The container flat cars were designed by the All-Union Research and Development Centre for Transportation Technology and manufactured at UWC’s railcar construction facilities in the town of Tikhvin (Leningrad Region). 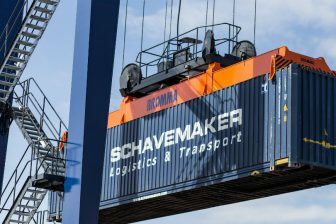 The demand for container flat cars in Russia is growing in line with the global trend towards containerisation in the transport industry. A total of 4.5 million TEUs were transported via the network of Russian Railways in 2018, 14 per cent more than a year earlier. All transport routes saw growth: about 1.9 million TEUs (+5.7 per cent) was carried inside Russia, 557.2 thousand TEUs in transit (+33.5 per cent), over 1.1 million TEUs to export (+16.9 per cent), and 859.8 thousand TEUs on import routes (+21.5 per cent). Shipments of loaded containers by all transport means increased by 13.8 per cent in 2018 compared with 3 million TEUs in 2017.